Historian A.B. Perkins said: This extreme erosion occurs on the crest between Bouquet and San Francisquito Canyons and is known as the "Gold Bowl." 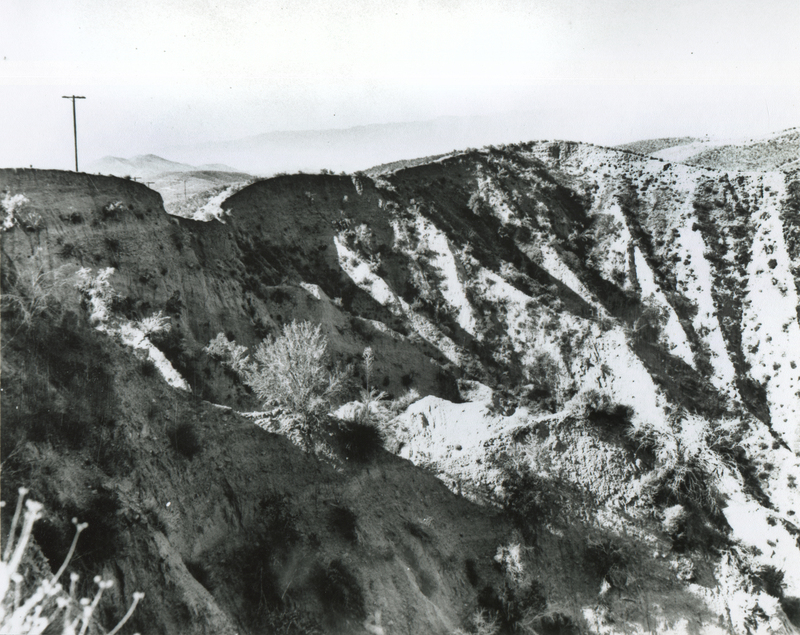 According to legend, the Gold Bowl yeilded the richest-paying placer deposits in Santa Clarita Valley history. Burros carried gold-bearing gravel in panniers out to San Francisquito Canyon, where it was washed at the well on the old Celis (later Frank LeBrun) Ranch. Photograph by Richard W. (Gus) Trueblood, 1963. The feature is located immediately east of San Francisquito Canyon Road and north of Lowridge Place. As of 2014, the North Copper Hill subdivision backs up against it on the east at Lowridge Place/Raintree Lane. AP2322: 19200 dpi jpeg from copy print.